Whilst diving in the Aegean and the Med in the 90’s, Murat Draman heard that some of the big-eyed fish hiding under the rocks had actually come from the Red Sea. Since then, impressed by this region and having decided to base his professional activities here, he had the opportunity to follow his interest in the amazing biodiversity and dynamics of Kaş underwater. Draman says that having the privilege to dive 12 months a year in Kaş-Kekova Marine Protected Area and being a stakeholder in this region made him see it as a duty to record and document his observations. A closed sea, the evolution of the Mediterranean is affected profoundly by invasive species. The Kaş region, given its geographical position, is influenced by those coming through the Suez Canal. Since its earliest days, this “lessepsian” migration has attracted the interest of scientists, locals and divers alike. They are following the changing biodiversity with curiosity and sometimes with concern. With this book, without a presumption of being scientific or complete, but rather tentatively an aesthetic approach, Draman offers his underwater observations on Red Sea species seen in this region between 2000 – 2015 with 128 photographs of 58 species. Commentaries are kept as short as possible, aiming at providing some species-specific or local information, through the eyes of a diver. Dr. Baki Yokeş made a valuable contribution to the book with his scientific highlights. It’s hard not to be amazed by nature’s creatures, but those that are underwater are harder to reach and mysterious: impossible to reveal those fabulous colours without the flashlights of underwater cameras. With the observation forms at the end of the book readers are invited to a citizen science application by reporting new species. 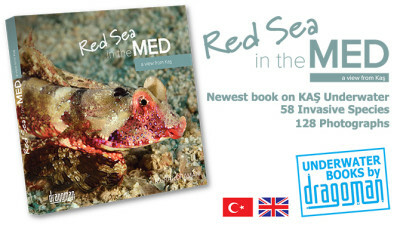 You can order your copy from www.redseainthemed.com.